Our bodies are divided into three different planes of motion, the sagittal plane, the frontal plane and the transverse plane. 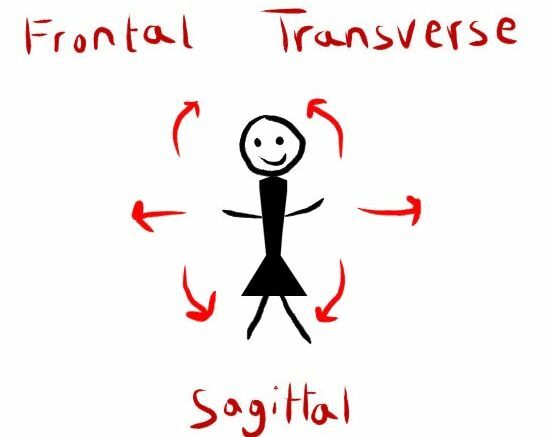 The Sagittal plane passes through the body front to back, so dividing it into left and right. Movements in this plane are the up and down movements of flexion and extension. The frontal plane divides the body into front and back. Movements in this plane are sideways movements, called abduction and adduction. The transverse plane divides the body into top and bottom. Movements in this plane are rotational in nature, such as internal and external rotation, pronation and supination. This workout is going to be using all three planes of motion. By training all three planes of motion you are increasing your range of motion, preventing injuries and providing stability for your body. Be the first to comment on "How to Tone Every Zone: Full Body Workout"